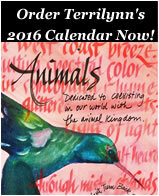 The 2016 calendar is devoted to Animals. As an art teacher I introduced a social justice art project about Endangered Species and our interaction with them. Students created large banners representing their chosen animal, and they are public display on our campus. See images below for sample pages and artwork (click images for larger views). The calendar began in 1990 as a yearly creative challenge and was gifted to friends and family. When my daughters lived at home and my mother was alive they assisted with the mass production. One year, my now math-teacher daughter made origami cranes. My (now accountant) daughter always helped glue in the extra ephemera and was the major assistant. Now the Calendar Girls assist. These women and I gather together to assemble and share a studio day or two or three or four, with many days of prep before these shared events. A culinary feast by Brian from BRIAN'S MUSTARD follows the traditional gathering. Every New Year is an opportunity for a creative challenge with a new concept. I research, make the artwork, find the quotes, create the calligraphy, and begin the process of the Limited Edition calendars. Each page has a story behind the images. The calendars have layered meanings and some day I intend to develop these ideas further into deeper stories. Every calendar has a bookmark, for my love of reading; a postcard, to encourage the written word; a recipe, for those meals we share; and a peace sign button, to visibly encourage PEACE. Every page includes hands-on work to attach the ephemera, hand sewing, and possibly some glitter. Since each calendar is added with different elements, no two are alike. Creating these calendars involves many hours of hand labor; for this reason, these calendars are produced in a Limited Edition. Terrilynn always includes a recipe with her Handpainted Limited Edition Calendar. Enjoy your New Year's Celebration with these festive delights. Select a recipe from the drop-down list below, then click Go. Or, Click the “Printable” button in any recipe below to view a printer-friendly page. The legend behind this Southern tradition is that a meal of peas and greens will bring prosperity and luck in the coming year. The traditional meal also includes pork, but this is a healthy variation and includes quinoa and corn. Cornbread often accompanies this meal. Heat a large, non-stick Dutch oven or chili pot. Add the onions and cook, stirring, until they soften, about 5 minutes. Add the bell peppers and cook for another 3 minutes. Add the garlic and cook for another minute. Add the black-eyed peas, broth, and everything up through the tomatoes. Bring to a boil and cook for 5 minutes. Reduce the heat to low, cover, and simmer until the peas are tender. The time will vary depending on the age of the peas, but count on at least 75 minutes, and add more broth if it looks like it’s getting dry. When the peas are tender, check the seasoning and add more to taste (this is a good time to increase the heat by adding more chipotle powder). Add the corn and quinoa and cook until the quinoa is tender, at least 20 minutes. (If the chili seems too “soupy,” uncover the pot; otherwise, keep it covered.) Add salt and pepper to taste. Serve with a squeeze of limejuice or slices of avocado, if desired. For slow cooking, in step 2, cook on high for 4-5 hours, low for 8-10. Add the quinoa and corn during the last hour of cooking. We have received many phone calls from past customers who either did not receive the calendar as a gift this year, or forgot to order one. If you would like to be on the list to receive a calendar for next year, please contact us. Many of the calendar images are available on cards. 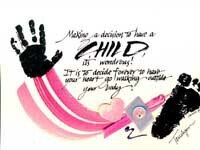 Please look at the mailable art & cards page to see other calligraphic, collaged pieces of art. Custom picture framing, gourmet mustard & epicurean delights, calligraphic art. "The oldest established frame shop in Escondido." ​Crafting custom picture frames since 1981. The Grand Galleria in Escondido, California, is a collaboration of two creative souls: Brian Tucker and his custom picture framing talents, epicurean mustard; and artist Terrilynn and her mixed media, social justice art, and calligraphic mixed media yearly calendars. The Grand Galleria: custom picture framing, custom picture frame, BRIAN'S MUSTARD, mustard recipes, sweet hot mustard, gourmet culinary skill, gourmet mustard, epicurean mustard, calendars, calligraphy, mailable art, handpainted calendar, calligraphic art and cards, cards, framed art, framed prose, limited edition calendar, Escondido, California. © Copyright 2004- Grand Galleria. All Rights Reserved.